Darjeeling: Kalimpong police have attached the properties of Dawa Lepcha, following a court directive. Lepcha is a former GTA member from Kalimpong and the brother-in-law of Gorkha leader Bimal Gurung. An agitation had taken place in the Darjeeling and Kalimpong Hills in 2017, which had culminated in a 104-day-long bandh. Lepcha, along with Gurung, had been charged in multiple cases and since then have been absconding. Lepcha has been charged under the Unlawful Activities Prevention Act (UAPA), multiple sections of the Indian Penal Code and the Prevention of Disruption of Public Property Act (PDPP). The court had directed Lepcha to appear in many of the cases. There was a warrant issued in his name as well. Later, the court had declared Lepcha as an absconder. A proclamation of attachment had also been issued by the court. 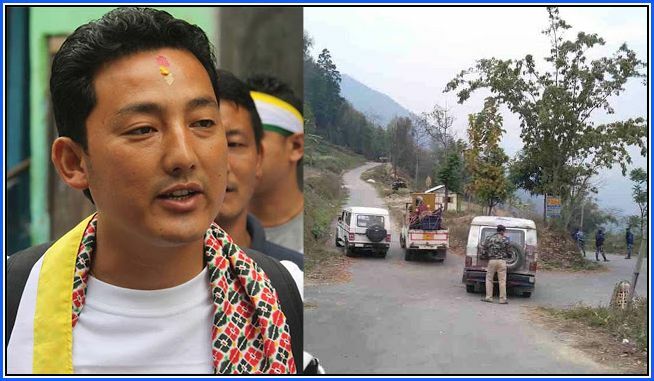 A large police contingent arrived at Lepcha's house located at Kashyong village in Kalimpong on Sunday. They took possession of whatever was there in the house, including furniture, utensils and electronic goods. Kalimpong police have attached the properties of Dawa Lepcha, following a court directive. Lepcha is a former GTA member from Kalimpong and the brother-in-law of Gorkha leader Bimal Gurung.